As you regularly inspect your deck for problems in between seasons, you may come across a handful of issues that you can easily fix over the weekend. While many deck projects may be simple DIY fixes, some may require professional assistance for a solution. Because your deck is such an important aspect of your home, it is essential to keep it properly maintained throughout the year. 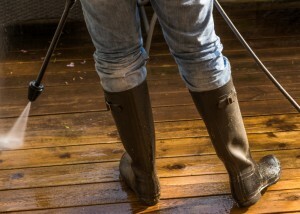 As you regularly inspect your deck for problems in between seasons, you may come across a handful of issues that you can easily fix over the weekend. However, more advanced issues, such as these commonly cited ones, may require the help of a deck professional to restore your deck to its original state. Not only are broken boards unsightly on your deck, but they are also dangerous for you and your guests who may be walking around. This often occurs due to fluctuating temperatures and moisture levels that may cause the boards to expand, bend, or crack over time. Particularly in between seasons when the temperatures are changing, broken boards may be a more common occurrence on your deck. Should you call a professional? Although one board may be easily replaced, multiple broken boards may call for professional assistance. Especially if you have an older deck, almost anything can cause discoloration of your deck boards over time. From snow and rain to wind and ice, the elements can quickly take their toll on a wood deck. If you’re up for a weekend project involving sanding and restaining, this may be a good weekend project. However, if you are unsure of how to go about repairing discoloration, it may be time to call a deck professional for some help with staining. Because wood takes are susceptible to changes caused by temperature change and moisture, rotting deck boards may be something that you encounter during a quick inspection of your deck. Mold and rotting wood can be hard to handle, making this particular issue a good excuse to call a deck professional. With the right equipment to handle rotting wood, deck professionals can quickly replace your rotting deck boards and make your deck look good as new in no time. Termite damage is an issue with wood decks that cannot be resolved as easily with a quick DIY project. For this, it is crucial to call the professionals right away so that the issue can be contained. Calling the professionals and resolving this issue as soon as possible can also prevent the spread of termites to your home, which can create an even larger issue if left untouched for multiple weeks.